In my never ending search for adapters, I’ve found that there were more record sizes, styles and speeds than I was ever aware of. I was so used to seeing the “normal” record sizes of 7″ and 12″ and “normal” speeds of 45 and 33 1/3 (ok, and an occasional 78) that I never really gave it any though to the fact that there were others secretly lurking out there. Additionally, I just kinda assumed that records were always laterally cut, never giving thought to other variations like the cylinder records. At some point I realized that I must not be the only one who thought this way, so I decided to dedicate a page to the records themselves. You could write novels on this subject, but I’ll keep it at a fairly high level for purposes of this website. Here you will not only see records of various shapes and sizes, but you will see different materials and playback speeds. The records are not listed in any specific timeline. So how many of these have you heard of before? The first records are ones that most of us have never played, and most of us have never even seen. These were mostly popular during 1896–1915, when they were simply called “records”. I don’t know about you, but these are definitely not what comes to mind when I think of records. These cylinders were invented by Thomas Edison and were the earliest commercial medium for recording and reproducing sound. In December of 1876, Edison was able to record and ultimately play back sound by using a thin sheet of tin foil wrapped around a hand-cranked grooved metal cylinder. Edison eventually improved the sound by creating a phonograph that employed a hollow wax cylinder in place of the tinfoil. In 1902 Edison marketed the “Edison Gold Molded Records”. The standard cylinders were roughly 4 inches long and 2¼ inches in diameter and played about two minutes of sound at 120 rpm’s. Edison’s cylinders were released in both wax and celluloid versions. The celluloid was much more durable and longer lasting than the wax. The record cylinders were sold in cardboard tubes (called “boxes”) with cardboard caps. Edison also released the Amberol brand in 1902 which played up to 4 minutes of sound or music. There’s a lot more that I could comment on regarding the history of the cylinders, but for this page I’m just trying to give you a little background. Here are examples of various cylinders and their boxes. Ok, and now on to the lateral cut records as we know them today. Just to give you a good visual as to the various record sizes and how they compare to each other, I decided to put them side by side so that you can get a general idea as to how large the difference between the various records sizes. When looking at this, keep in mind the normal LP is 12″ and the 45 is 7″. I never dreamed that there were 16″ records (HUGE), or on the opposite end, 2′ records (TINY). I have heard that there are 14″ records out there as well, but I’ve never come across any….yet! It’s important to note that on any given size record, it was not limited to any specific speed. For example, a 10″ record could have speeds of 33 1/3, 45 or 78 RPM’s. They could even vary in thickness. The old Edison Diamond Disc records, and even many of the more common 78 records were much thicker and what you would expect to see with today’s LP’s or 45’s. This is a very large 16″ record. These records are normally referred to as transcription discs and were normally used for, or recorded from, a radio broadcast. These discs recorded and played at 33 1/3 RPM and were popular roughly between 1930 and 1960. The discs usually held about 15 minutes of audio on each side, but this was occasionally pushed to as much as 20 minutes (later in the mid-50’s, microgroove technology allowed times to reach 30 minutes). Some of these discs were labeled “outside start” or “inside start” since some records started at the typical outside edge of the record while other started from the inside and played out. 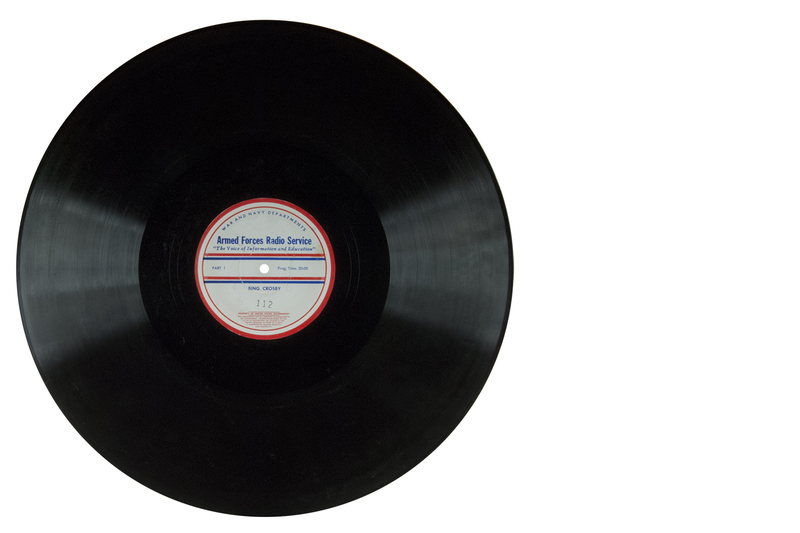 During World War II, 16″ pressed vinyl records of transcription recordings from major American radio networks were distributed worldwide by the U.S. Armed Forces Radio Service for rebroadcast to troops in the field. These discs where considered government property and were supposed to be destroyed after they had served their purpose. As it turns out, some were saved as souvenirs and countless thousands of them were simply dumped rather than actually destroyed. Many of the dumped discs ended up in the hands of scavengers and collectors. Often, these discs are the only form in which the broadcasts on them have survived, and they are one of the reasons why recordings of entertainment broadcasts from the 1940s still exist in abundance. Here is an example of a 16″ record. It is an Armed Forces Radio record of Bing Crosby. Clearly the most common sizes of record holes are 1 1/2″ for 45’s and roughly 1/4″ on LP’s, 78’s and a good number of 45’s. There have been other sizes though. A company by the name of Standard Records had a half-inch hole and Harmony Disc Records had a 3/4″ hole. On the larger side, Seeburg records which were introduced in 1959 had a 2″ diameter hole and Aretino (1907-1914) had a 3″ hole. There were also other variations as well. For example, Busy Bee records had a standard sized hole and an additional large “race track” hole which helped to reduce slippage. Thus Busy Bee could be played on a standard phonograph in addition to the proprietary format sold by the O’Neill-James Company. There were also tiny Berliner discs (1889) which were 3.2″ in diameter and had a key-hole shaped spindle hole to also prevent slippage. On the more unusual side, I also heard that in the early 1900’s there were Canadian Berliner (Victor) records and others which had a brass grommet around the center hole. The players in turn, had a nut which fit the threaded center spindle and locked the disc in place for playing. Sounds like a good start to the phrase “cranking the music”. Probably the most unusual of all is the NON’s Pagan Muzak from 1978. This was a one-sided 7″ record that was housed in a 12″ sleeve containing nothing but 17 locked grooves on side A and a blank side B. The record had the typical center hole but also a second hole which was off center. The hole was drilled by NON’s Boyd Rice himself since the manufacturing plant refused, theoretically doubling the permutations of various sounds. This meant that each locked groove could be played at different trajectories as well as any number of speeds. It was really up to the user. The original release came with instructions for the listener to drill more holes in the record as they saw appropriate as holes in different locations would create different effects. The 17 grooves are mostly noisy tones and drones and clanks of an industrial nature, with lots of distortion, some of them quite irritating, though most of them become quite mesmerizing and hypnotic after repetitive cycles. I could write pages on the history of all the record speeds, but I’ll do my best to just give a brief overview here. Lets start with the record cylinders. The early manufactured cylinder recordings were usually cut at a speed of about 120 rpm and was capable of playing about two minutes of music. It’s interesting to note that they were made of a relatively soft wax formulation and would wear out after only a couple dozen plays. Over time, the type of wax used was improved and hardened so that cylinders could be played with good quality over 100 times. There were also the less popular 8 1/3 RPM records. Those though, were developed by the American Foundation for the Blind. These records which were normally 10″, would play roughly 4 hours of speech. This format was also used on some of the flexible discs that were found in magazines. The slightly more common 16 2/3 RPM records were almost always used for spoken word only although it was also used on the 9″ Seeburg 1000 records. Because of this, some early record players included the 16 2/3 record speed as a playback option. The slowest speed that I’ve been able to find anything on would be a fairly recent release. During Jack White’s third anniversary of this Third Man Records label in 2012, the attendees were each given a copy of an LP entitled The First Three Years of Blue Series Singles On One LP. Believe it or not, this LP actually played at 3 RPM. It consists of 56 songs by 28 bands previously released on Third Man’s Blue Series 7″ single line compiled on one blue vinyl 12″ record, and then mastered at 3 RPM. On a side note, it’s interesting to mention that in the early 1920s, the World Record Company in the U.K. introduced longer-playing records with speeds measured in inches per second rather than revolutions per minute. The speeds for these records were specified on the label by a letter ranging from A to D. This format was never adopted in the USA. Ok, let’s go way back. Right around 1877 or so, Thomas Edison first tried recording sound on a wax-impregnated paper tape but didn’t have a lot of luck. But he stuck with it and he eventually had some success when using tinfoil wrapped around a grooved metal cylinder as a recording medium. The problem with the tin foil was that it proved to be too crude for any commercial use. About 10 years later and a lot of testing, Edison eventually employed a hollow wax cylinder, which played for up to 2 minutes, with much more success. Beginning in 1889, prerecorded wax cylinders were commercially marketed and dominated the sound market through the early years of the 20th century. In 1909 Edison did manage to improve his original wax design by introducing wax cylinders that played for roughly 4 minutes under the Amberol brand. These were made from a harder, although more breakable, form of wax to withstand the smaller stylus used to play them. Exact formulas for this compound varied by manufacturer and over the course of time, but it was typically composed of about one-third shellac and about two-thirds mineral filler, which meant finely pulverized rock, usually slate and limestone, with an admixture of cotton fibers to add tensile strength, carbon black for color (without this, it tended to be a “dirty” gray or brown color that most record companies considered unattractive), and a very small amount of a lubricant to facilitate mold release during manufacture. Some makers, notably Columbia Records, used a laminated construction with a core disc of coarser material or fiber. Over the lifespan of the 78 records, increasingly less abrasive formulations were created that had noise levels as low as vinyl does. The use of the shellac records lasted in the US into the 1950’s and the 1960’s overall. Not a bad run! In the early 1900’s during the run of the 78 records, both the US and UK had developed flexible records and were marketed as unbreakable. These were made of celluloid or a similar substance coated onto a cardboard core disc. They only lasted a few years though as they had exceptionally high level of surface noise. Then again in the 1930’s, German Phonycord and the British Filmophone and Goodson also created flexible plastic records. As with the earlier version, these did not last. Also during the early 1930’s the US saw what was called “Hit of the Week” records. They were made of a patented translucent plastic called Durium which was coated on a heavy brown paper base. What made these unique was that a new issue came out every week and they were sold at newsstands like a weekly magazine. Unfortunately, although well accepted by the public, they soon fell victim to the Great Depression and production in the US ended in 1932. While all this was going on, RCA Victor introduced their vinyl-based Victrolac compound for some limited record releases in 1931. As this technology advanced, it became clear that vinyl’s advantages of light weight, near unbreakability and low surface noise made this a superior choice for records. Unfortunately, the much higher cost of the raw material required to produce these records compared to the shellac records, made them impractical for general commercial use. The V-disc (short for Victory Disc) did use vinyl for their records during World War II when shellac supplies were extremely limited. The 12″ and 16″ records were used as a morale-boosting initiative from 1941 through 1949. Following the war, the wider use of vinyl became more cost effective and practical as new record players with improved pickups and precision needles were developed. By 1945, RCA Victor started producing the first transparent colored vinyl in red. Today, most all records are made of vinyl. Cardboard records? Why of course! They were originally manufactured on Wheaties boxes in the 1950’s and continued to delight children (and annoy parents) through the 1970’s. Sometime during the late 60’s/early 70’s Post Cereals started putting some records on the back of their cereal boxes. I believe I got mine from the back of Post Super Sugar Crisp. I recall seeing Bobby Sherman, The Monkeys, The Jackson 5, and of course the best group EVER, The Archies. 😉 The cardboard records were basically Flexi-Discs that were embossed directly into the back of a box such that the record could be cut out and played on a turntable. Getting them flat (and centered) was usually the hardest part of playing them. Some fun memories. Along the same time as the cereal cut-out records, in January of 1979 National Geographic released an issue with a flexible vinyl record enclosed. This type of record was also called a Flexi-Disc (also known as a Phonosheet or Soundsheet). The record was titled Songs of the Humpback Whale and had a production order of 10,500,000 copies. It became the largest single press run of any record at the time. I recall being banned from playing this record on the family record player because my mother was convinced that playing it would destroy the record player. So after saving it for all these years, it’s finally found it’s place on this site. I knew there was a reason that I held onto this! Records were also embossed onto post cards. 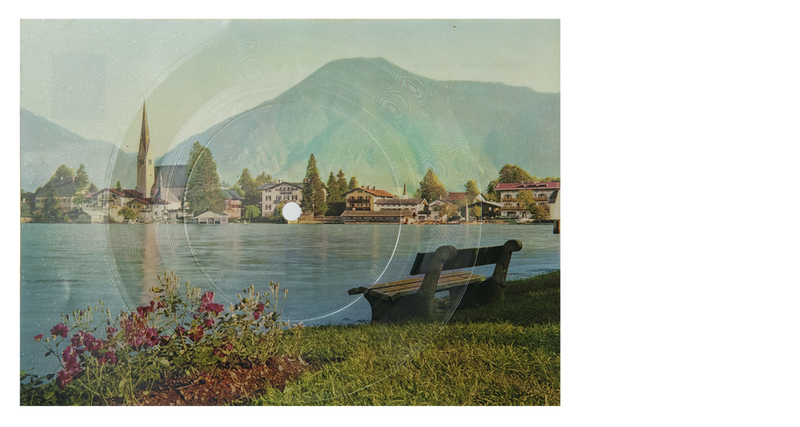 The picture on the front is of this particular postcard is from Ninophon Munchen, Nurnberg and the record plays Tegernseer Landler Volksweisen. The record does not indicate a date, but does show that it was made in West Germany. It took me a little research to figure out this next item. To me, this looked like nothing more than a floppy 45 record, similar to the one shown above. Well, I was wrong. This is actually a recordable disc from the 50’s that played on the McGraw Edison Voicewriter dictation machine. It was manufactured by Thomas A. Edison Industries, a Division of McGraw-Edison Company, as distributor for Edison Voice writer Dictation Equipment in Northern Ohio and Western Pennsylvania. I’ve seen videos of this machine recording and re-playing and I was quite impressed by the quality, especially for the time period that this was manufactured. Recordable Diamond Discs were one of the first home recording formats, something that largely disappeared from the market for many years until the rise of magnetic tape. The discs were thin transparent red vinyl and the user would insert it into the machine. It had no grooves on it and ran at 16 rpm. During the recording, the machine did not cut the disc, instead it “embossed” it so there was no debris. An image of one of the versions of the machine is shown below as well. Other records with different materials such as Metrolite, Merco Plastic and Sav-o-flex have also made in the past, but were used mostly for children’s records since they were for the most part, unbreakable. This record definitely gets an honorable mention. The Voyager Golden Records are phonograph records which were included aboard both Voyager spacecraft, which were launched in 1977. As thier name implies, they were recorded on solid gold. They contain sounds and images selected to portray the diversity of life and culture on Earth, and are intended for any intelligent extraterrestrial life form, or for future humans, who may find them. Colored and multi-colored records have been around since the early 1910’s but were never really very popular. Then in 1945, RCA Victor marketed it’s ruby-red “non-breakable” record. It was made of a translucent vinyl resin plastic and cost nearly twice the price. Then in the 60’s they reappeared, but normally only for promotional copies of records. Finally in the 70’s (and continuing through the present day), colored records became much more popular. The records are available in many colors included clear, transparent white, red, blue, yellow and multi-hued. Here are some examples of colored records. These next two are a little different. The first one is called a splatter vinyl…for obvious reasons. I honestly don’t know what to call the one on the right other than two toned. No matter the names, it’s a step forward from the solid vinyl records displayed above. 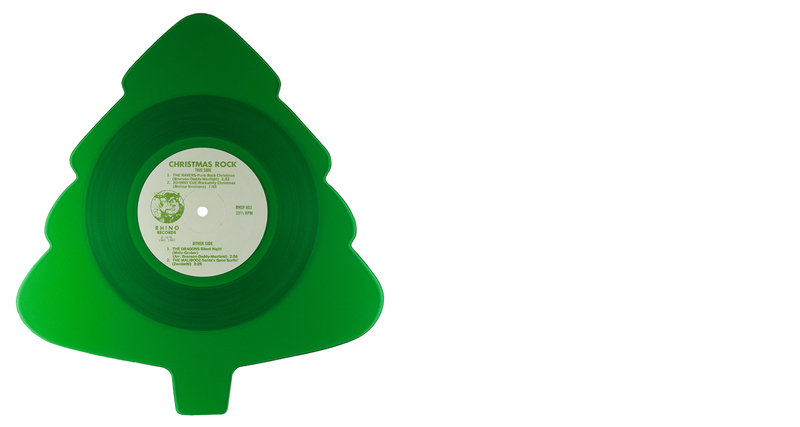 It’s quite common to see records pressed in various shapes. These are normally referred to as shaped discs. The center of the record would resemble a standard 45 record, but there is a wide and irregularly shaped non-grooved outer rim that is cut to basically any shape that does not cut into the grooves. Some designs match the theme of the record while others are just pretty much designed to be in odd shapes. Many of the shaped records appear to be pressed in clear vinyl, but definitely not all of them. Here are a few examples of various shaped 45 records. Another variation of vinyl records are picture discs. Some variation of picture discs have been around since the 1920’s. They seemed to disappear sometime in the late 40’s, but then reemerged again in the 70’s. These are normally the size (and shape) of a normal un-dinked 45 record (small hole). What makes these unusual is that the image is imprinted in the grooved playing area, and not just on the record sleeve. Occasionally you’ll also see some with a picture plus shaped vinyl similar to the examples shown above. Here are two examples of 45 RPM picture discs. Picture discs also come in 12″ LP format. It never hurts to come up with an excuse to post a Brigitte Bardot picture either! I’ll keep my eyes open for new takes on the vinyl record! This can get a bit confusing, but I’ll keep this at a fairly high level so you don’t completely fall asleep while reading this section. There are some variations on grooves so it’s worth mentioning here. First of all, let me explain what a locked groove is. Say you’re playing a record on side A and you get to the end of the record. At some point, the record stops advancing further and simply goes around and around in the center (unless you have an automatic arm of course). That last groove which is located at the inner most playable part of the record is the locked groove. It’s kind of the road to nowhere when it comes to vinyl records. Probably the most famous locked groove at the end of a record was The Beatles 1967 release of Sgt. Pepper’s Lonely Hearts Club Band. Wikipedia does a nice job of explaining this. Many UK copies featured a multi-layered collage of randomized chatter in their run-off loops. However, two variations were made: the original British pressing (black label with gold logo) has the “inner groove” play through the entire locked groove and does not include the laughter at the beginning of the piece. The re-issue of the British pressing (black label with silver logo) starts playing the “inner groove” long before the needle reaches the locked groove, includes the laughter and, once the needle hits the locked groove, the listener only hears the last two seconds of the piece played over and over again. The Who responded by putting a musical locked groove at the end of their 1967 album The Who Sell Out. Most records have this locked groove at the end of each side of a record. But of course there are exceptions, right? Some educational and commercial records had locked grooves between each track on a single side of a record. This would allow the speaker to discuss what they had just heard prior to moving to the next track. To move to the next track, you would then have to pick up the needle and move it slightly past the locked groove so that the needle could advance to the next track. There is also something called the lead-in groove. This was developed by Decca to correct any issues with jukeboxes. Since not all jukeboxes needles start at the exact same place, there were problems where the needle would rest too early or too late in the record. To compensate for the differences in records and jukeboxes, they decided to put some blank grooves at the beginning of the record. This would normally require the player to make numerous rotations prior to the music starting. There are also parallel or concentric grooves. With these, the records are made with two or more separate, interlaced spiral grooves. It’s basically two tracks located side by side on the record. Therefore, depending on exactly where you set the needle down in the lead-in groove, you would play one of the two tracks, but not the other. Starting in the 20’s, some records were made with inside-to-outside recording. So instead of placing the needle on the outside edge of the record, you would place it closest to the center and it would play outward. Why play them from inside to outside? Well, thanks to Jerry who contacted me, I actually have an answer to that question To quote him: “The outer grooves produce better fidelity than the inner grooves because of their greater groove speed (in relation to the stylus). Radio programs that were too long to fit on a single disk side often had the second portion of the program mastered “inside start.” The first portion of the long program was “outside start,” and the fidelity would diminish subtly as it played toward the center of the disk. If the second part of the program had also been mastered “outside start,” the quality would jump noticeably from “poor” to “good” as the two disks were segued. Less jarring was a “poor” to “poor” segue with the second half of the radio program subtly improving in quality as it reached the outer grooves and the end of the show.” Thanks again Jerry for shedding a little light on this! …so THAT should be more than you ever wanted to know about record grooves! I’m not sure why, but for some reason I’m intrigued by the Edison Diamond Discs. It was a type of record that was produced on the Edison Record label from 1912 to 1929. The 80 RPM records could only be played on the matching Edison Disc Phonograph that was fitted with a precision-made, semi-permanent diamond stylus. The standard lateral discs during that time had a relatively constant depth and the sides of the groove where scalloped which created the sound. In contrast, the grooves on an Edison Diamond Discs were smooth on the sides and instead used variable depth to create the sound. Since the Edison Discs used up and down movement rather than side to side, the Diamond Discs could not be played on ordinary disc record players as their disposable steel needles would damage the records while extracting almost no sound. The 10″ discs also had a much finer grooving than that on regular lateral discs and played considerably longer. You’ll know when you see one of these because they are also a beefy 1/4″ thick which prevented warping. Even though the Diamond Discs had better audio fidelity, they were more expensive than regular discs and unfortunately incompatible with other brands of record players. These issues (in addition to Edison’s insistence on imposing his own musical tastes on the catalog) caused the Diamond Disc to ultimately fail in the marketplace. As a side note, a later Edison dictation system called the Voicewriter, re-used the name ‘Edison Diamond Disc’ from the 1940’s for the unrelated recording medium. Here is an example of an Edison Diamond Disc. Russ Orcutt founded All About Records to release a 7″ for his friends in All Chrome in 1997. RE: Why 78rpm? This speed was easy to achieve with common 3600-rpm motors with a 46-tooth gear. RE: Why “Inside Start”? The outer grooves produce better fidelity than the inner grooves because of their greater groove speed (in relation to the stylus). Radio programs that were too long to fit on a single disk side often had the second portion of the program mastered “inside start.” The first portion of the long program was “outside start,” and the fidelity would diminish subtly as it played toward the center of the disk. If the second part of the program had also been mastered “outside start,” the quality would jump noticeably from “poor” to “good” as the two disks were segued. Less jarring was a “poor” to “poor” segue with the second half of the radio program subtly improving in quality as it reached the outer grooves and the end of the show.